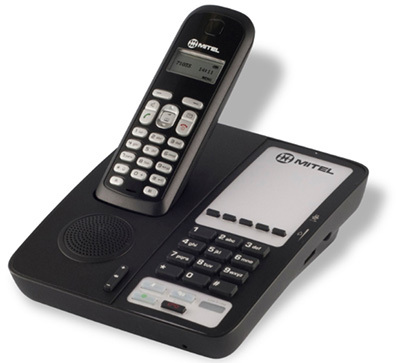 If you are deploying IP to guest rooms, you'll want to consider the unique hospitality feature set offered by Mitel's MiVoice 5505 cordless guestroom IP phone. This compact, stylish cordless phone has all the physical features you'd expect in a hotel room phone, including a high quality full-duplex speakerphone, programmable speed dial keys, a large faceplate area for custom branding and dialing instructions, a cordless handset locator and a physical ringer volume control switch. With its built-in, two-line backlit display, it provides an intuitive user interface, allowing guests to take advantage of self-programmable features such as an alarm clock, phonebook, customizable ringer volume, choice of ringer melodies and language selection. This DECT 6.0 cordless phone has an operating range of up to 50 meters (150 feet) from the phone base. Up to three extension handsets are supported, so you can use the MiVoice 5505 cordless handset as a second phone for a guest room or suite of rooms. Five programmable speed dial keys for access to hotel amenities, etc.